Throughout the show, the members encouraged the audience to jump, clap, and sing along to their songs. Indeed, the concert seemed more focused on SHINee’s musical abilities and range in genre than on giving flashy performances or simply pleasing the crowd. Past megahits like “Lucifer” and “Ring Ding Dong” were conspicuously absent while lesser-known songs were trotted out to fit the themes of each section. 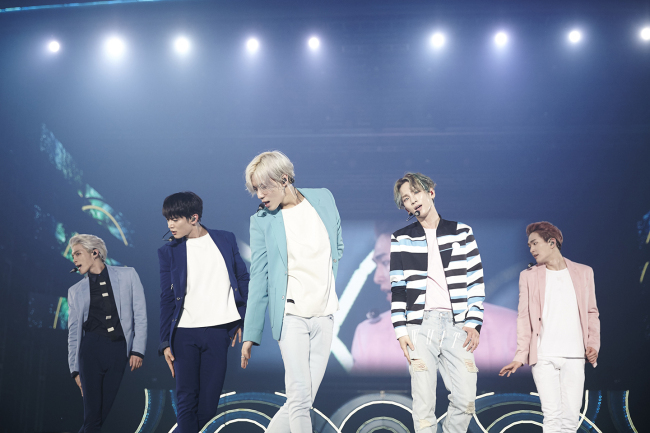 The show also devoted a significant portion to SHINee’s ballads. “We actually have a lot of great ballads on our albums, but we don’t get many opportunities to sing them for you on the air,” said Jonghyun. Rather than having solo performances for each member, in this concert the SHINee members had their chance to shine in short parts within group songs. Onew showed off a tap dance for “Close the Door,” Taemin danced with lasers in “Alarm Clock,” and Jonghyun had a strong, shouting solo in “Excuse Me Miss.” Key gave a playful puppy performance during the new song “Woof Woof,” and Minho earned himself the biggest cheer of the night when he tore off his shirt and performed the end of “Dynamite” shirtless. The three-hour concert doubled as a gigantic showcase for the five-member boy group’s fourth studio album “Odd,” released at midnight Monday. The album is the group’s first in a year and seven months, and is released just one week before their seven-year anniversary. They performed five songs from the 11-track album: the title track “View,” as well as the songs “Love Sick,” “An Ode to You,” “Woof Woof,” and “An Encore.” Right after performing their new title track “View,” the show immediately played a video clip of SHINee’s first ever broadcast appearance seven years ago, showing just how much they had grown. The event overwhelmed the SHINee members, and Key and Jonghyun broke down in tears during the encore performance of SHINee’s debut “Replay.” Jonghyun, in particular, choked up and was unable to speak for a while. The concert ended upbeat, with the members getting up close and personal with the crowd, and tossing signed balls and discs to their fans.